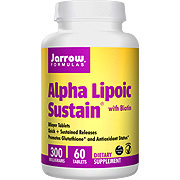 Alpha Lipoic Acid Sustain 300™ is in a sustained release format to minimize gastric irritation and blood sugar fluctuations. Alpha Lipoic Acid is a disulfide molecule (containing two thiol groups). A thiol (or -SH) consists of a sulfur and a hydrogen atom. This unique lipid and water soluble antioxidant promotes the synthesis of glutathione. It is also a cofactor in energy production, helping to regulate glucose metabolism. Biotin is added for optimum ALA activity. Other Ingredients: Polyacrylate polymer, calcium phosphate, cellulose, stearic acid (vegetable source), magnesium stearate, silicon dioxide, and vanilla. Contains NO common allergen. Suitable for vegetarians. Alpha Lipoic Sustain 300 - is shipped in a discrete, unmarked package. Orders are processed immediately and usually take about 3 to 5 working days to be received. We do ask that you try it for 2 to 3 weeks to feel the full effects. Any information received is used only for order processing and shipping purposes. Your information, such as e-mail address, will never be disclosed to a third party.